Who is this so-called wolfman? After experiencing one of the most amazing and educational outings I've done in recent memory, I dubbed my host, Steve Hall, "the wolf man." 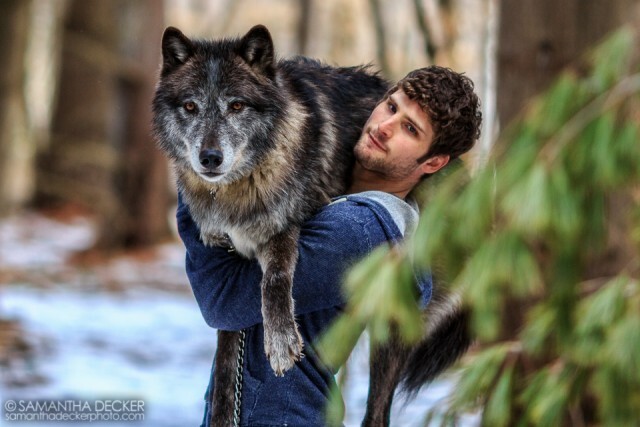 Steve conducts almost daily walks with the wolves who reside at the Adirondack Wildlife Refuge and Rehabilitation Center (AWR) in Wilmington, NY. Steve's running commentary during the wolf walk will both amaze and educate you, I guarantee it. The NYS Dept. of Environmental Conservation (DEC) wildlife specialists contend his knowledge of wolves far surpasses even theirs, as they told him when he and his wife, Wendy, applied for their necessary wildlife handling permits several years ago. We here in the region are fortunate they easily qualified for the permits. AWR is indeed a very, very special place. A sense of calm and safety came over me as I walked the long drive through the snow-blanketed forest and drew closer to the house and the enclosures that make up Adirondack Wildlife Refuge. Then suddenly the alarm went off! Many such places have motion sensors to alert the owners or staff someone has arrived on site. 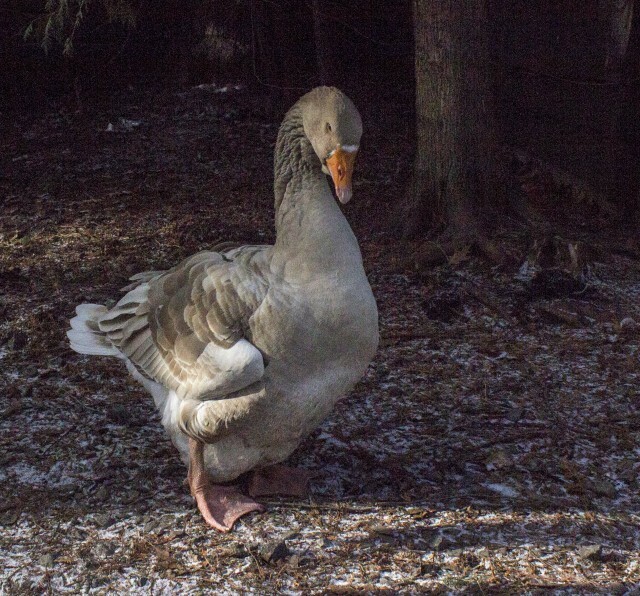 ARW has Charley - a big brownish-grey domestic goose! There's no sneaking up on Charley. He squawks and chatters and waddles right over when visitors arrive. He misses nothing! Charley was found wandering around a residential area and came here to live at AWR a few years ago. His owners never claimed him. Their loss. He's quite vocal when newcomers wander into the yard and he even came and gave my legs a few quick nips (harmless little nibbles actually). Was this a greeting or was he just admiring my red coat, or was it a warning? "Watch out for me?" Only Charley really knows. I wasn't questioning! In the early 2000's, Steve and Wendy Hall made the decision many visitors make - to move to and live in the beloved place they had vacationed for years. Their hunt for the perfect place came about very quickly by a chance meeting between their young son Alex, and a parrot (yes, a parrot) on Main Street, Lake Placid. You'll have to ask Steve to tell you the story. There was total karma involved. 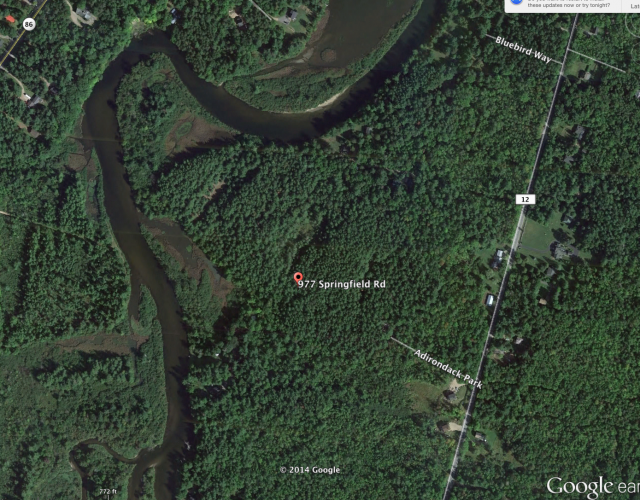 In 2002 they moved into their expansive dream property along the banks of the West Branch of the Ausable River. Steve became a real estate broker and started a vacation rental business. Wendy continued the rehabilitation efforts she had been involved in for years at their former home. It was a few years before they applied for and received licensing to operate as a refuge and rehabilitation center, however. Different types of animals require different permits. Birds, for the most part, are protected by federal law, requiring licensing from the federal government. Most other animals are covered by state regulations. There is even a special license for handling of "rabies vector" animals such as raccoons. As licensed wildlife rehabilitators, they’re constantly on call to rescue injured animals in the immediate region. Wildlife rehabilitators are charged with providing professional care to sick, injured, and orphaned wild animals, with the ultimate goal of returning them to the wild whenever possible. It is not a rehabilitator's goal to turn wildlife into pets. Their wild patients are only held long enough to ensure their survival in the wild whenever possible. Fear of humans is a necessary part of survival for all wildlife. Every attempt is made not to allow the sort of bonding that would cause any animal who has the potential to return to the wild to lose its fear of people. In some cases this is quite challenging. Rehabilitators are also educators. Naturally, in the course of rehabilitation, every rehabilitator winds up with some animals that cannot be returned to the wild for one reason or another, such as the great horned owl at AWR who has a broken wing and whose days of hunting are over. He'll live a nice long life here and be well fed. Typical injuries that lead to life in captivity would be those that render them unable to fly, hunt or flee from predators in the wild. Many of the animals at AWR are utilized in educational programming. Wendy and Steve and several of their birds are familiar to folks who’ve attended events in the region. The education they bring to the public is invaluable. 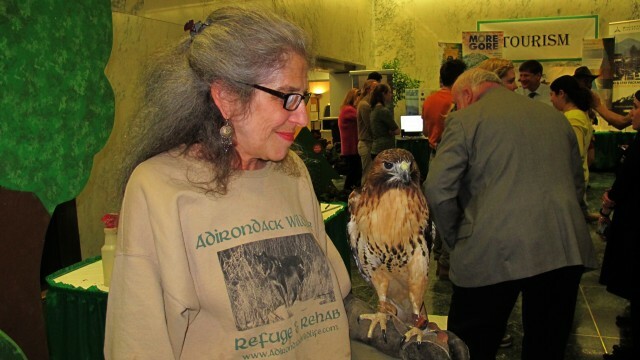 I've had the pleasure to attend several events at which the wildlife from AWR has been featured. The current residents of AWR are as diverse as the forest. 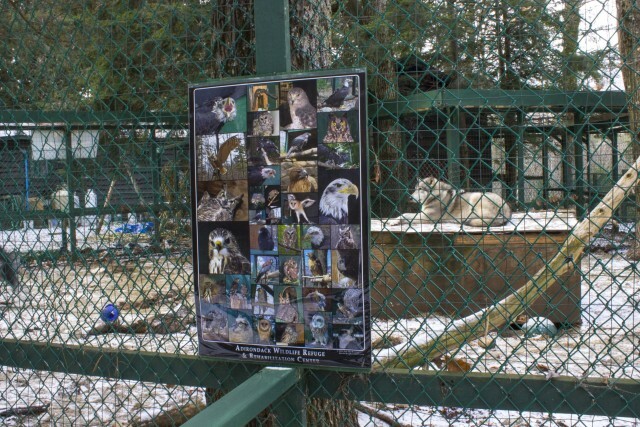 In the several carefully constructed enclosures reside fox, ravens, bald eagles, hawks, owls, falcons, bobcats, a coyote and more. However, the biggest "attraction" is the enclosure in which Zeebie, Cree and Kiska live. These three hold the distinction of being the best ambassadors AWR is fortunate to house. What are these magnificent creatures that draw so many folks to visit AWR? Wolves. Zeebie is full wolf, whose parents were actors. Cree is a wolf hybrid (3/4 wolf and 1/4 Alaskan malamute). Seven-month old Kiska is also a full-blooded wolf who was born in captivity and acquired by AWR last Spring as a baby. It is these three animals the public can somewhat interact with during the wolf walk which takes place mornings at 10 a.m., Thursday through Monday (AWR is closed to the public Tuesday and Wednesday). Steve Hall's day starts early, along with the rest of crew at AWR which includes Steve and Wendy's son, Alex, and interns Kate Murphy and Jonas Borkholder - whom I met the day I visited. Steve described Jonas as "the heart and soul of the rehab program." Jonas is the staffer who holds the "rabies vector" license. The birds and animals in their care require constant monitoring and feeding, which is predominantly Wendy's and the intern's areas. Recovering baby birds will require feeding every twenty minutes and others as little as once a day. Depending on what types of wildlife are in their care at the time, the schedule varies. Steve starts his day answering emails and phone messages. Needless to say, they get a lot of correspondence. There are also lots of phone calls at all hours from folks who think they've found an animal in need of rescue. Much of the time the animal being reported is a baby, who is actually perfectly fine where it is. Education is important at this point, making people understand that baby animals for the most part should be left right where they are. Mom is more often than not close by and dutifully taking care of the baby. Kate explained to me that nine times out of ten a rescue is unnecessary and what the caller is witnessing is perfectly normal behavior, especially during Spring when young are developing. During the morning while Steve answers correspondence the rest of the crew check and feed the resident animals, and patients are given whatever care is required. By a bit before 10 a.m. visitors begin arriving for the Wednesday through Monday Wolf Walk, a highlight of the day at AWR. Steve greets the guests by entering the wolf enclosure and interacting with the wolves, who are very playful and very clearly have a strong bond with him. He begins by talking about the three wolves and how they came to live at AWR. When I visited there was a mostly eaten deer carcass inside the enclosure as he talked. He explains that this was a road-killed deer. The wolves have consumed most of it. The deer skeleton lies mostly bare and the hide has been ripped off and lies a short way away. Very efficient, those wolves! 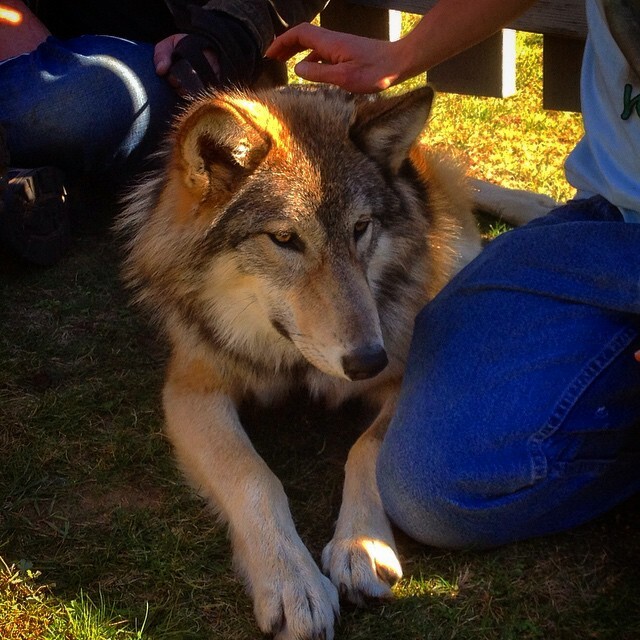 We begin the wolf walk with Steve and the wolf hybrid Cree, who is leashed. As we head out up the driveway Steve talks about the three resident wolves, the connection of wolves to our domestic dogs and then launches into his incredible discussion of wolves and their ways. He tells us it is illegal for us to touch Cree or encourage him to approach us. Cree, however, is allowed to approach us and sniff us if she so chooses, but we can't initiate it. He never stops talking and it's FASCINATING! We learn about the family life of wolves and why they do what they do and why they are an invaluable part of the natural order. We also learn about why they've unfairly been given such a bad rap by man. They are greatly misunderstood creatures. We learn that wolves are called "keystone predators" and that they are important to "culling" the populations of their prey animals by mostly preying on the weak and injured in those groups. It's the "natural selection" of the wild which is so often misunderstood by the casual observer. We also learn that every single domestic dog in the world, no matter the breed, evolved from wolves. Your very own family dog still contains wolf DNA and that's a guarantee. Steve's knowledge of wolves comes from years of studying and living with these magnificent animals. Along our walk Cree exhibited behaviors and Steve would explain what they were all about. One in particular is common to domestic dogs. You'll notice our pets frequently 'scratching' the soil with their front paws. Steve explained that dogs have scent glands between their toes and this scratching on the ground imparts their scent as another way to 'mark' their territory. They have many ways of 'marking' in addition to the commonly recognized urinating on everything in sight, as we see so many male dogs doing. After a short while, Kate leading Kiska and Jonas leading Zeebie pass us and disappear into the woods. As we make our way along the public fishing access path down to the river, Steve explains more and more about the life of wolves and their evolution, as we all observe Cree doing what wolves do. Much of Steve's discussion is contained on a page on their website which you can read. I'll warn you, however - it's way more interesting listening to Steve explain it during the Wolf Walk while hiking with a real live wolf alongside you! At one point we stopped and listened to Cree howl over and over, attempting to communicate with Zeebie and Kiska, who were somewhere far ahead on the trail. The above video of this behavior was taken during our walk. 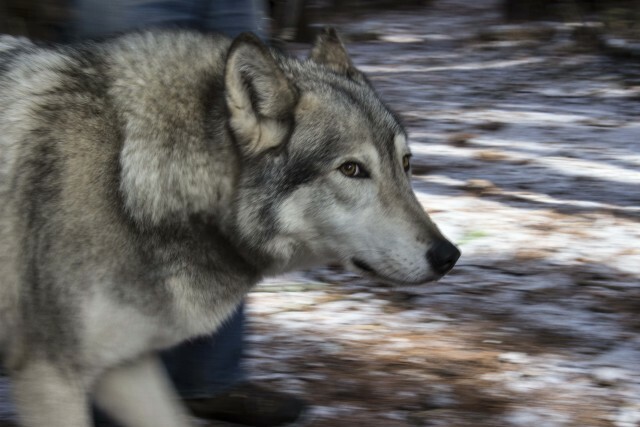 There's also a super cool "spin" photo of wolf walking on AdirondacksUSA.com. Check it out. The trail leads to, and continues along, the Ausable River where evidence of beaver activity is pointed out by Steve. Small saplings have been chewed off about 10 inches above the ground. The beaver eat both the bark and cambium layers of the trees. They sometimes eat the entire sapling, but mostly they use the barkless sticks for repair work or additions to their dams and lodges. They stash vast supplies of sticks with bark still on them under the water for food supply during the winter months. They cannot come up from under the ice for long periods when the ice is solid on the river. Don't worry though, their lodges have a dry, cozy room that IS above the water line where they spend the winter and Mom gives birth to pups during that time. The lodge has an exit/entrance allowing them access to the river underneath the ice. It was a very cold day and Steve picked up the pace as the woods gave way to open meadow (the "wolf meadow") and the wind whipped at us across the frozen surface of the river slough (pronounced "slew", it's a backwater area of the river). We were never able to catch up to Zeebie and Kiska and soon found ourselves back at the compound of the refuge. 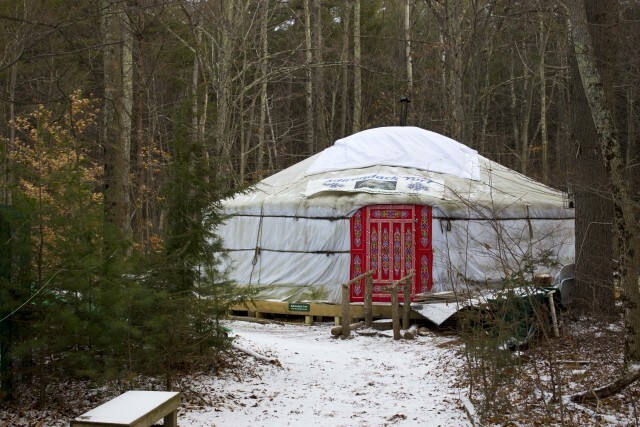 The trail ends at the yurt where the interns live. One of them was kind enough to let us peek inside. A wood stove was blazing away and the temperature must have been in the mid 80's inside, a far cry from the bitter cold outside! Yurts are nomadic Mongolian tent structures that have grown in popularity around the world the last few years. I have had a not-so-secret yearning for one of these structures. (pssst - they are temporary and I'm told don't require permits). Thus ended the Wolf Walk and Steve pointed out the donation boxes and kindly encouraged us to make a donation. The AWR functions entirely on donations as it does not receive any federal or state funding for the wonderful work they do there. The donations go a long way to providing AWR's ability to continue rescuing, paying vet bills, feeding and giving shelter to many, many animals. Later on after the walk, over tea, I asked Steve, Kate and Jonas what their biggest challenge has been while working with all these incredible animals at the Refuge. Jonas began telling me about the baby fisher they rescued last spring. The fisher became his charge. He told me his biggest challenge was trying not to become attached to it because they hope to be able to release it back to the wild when it's old enough and hopefully ready. It's proving to be a major challenge for poor Jonas. How do you NOT let yourself become attached to a living, breathing baby animal who is depending on YOU as its sole provider for its survival. Tough job. Jonas told me when he realized how attached he was becoming, he started to ween the kit from the attention he was giving it. The fisher kit is housed in the bear enclosure - a large, high cement walled enclosure with no windows and a screen roof, the object being to keep it from seeing human beings (except for Jonas, that is). He told me he would hear the kit screaming all over the compound all day and it tore his heart out. I can only imagine. That would be the hardest part for me if I worked at AWR. 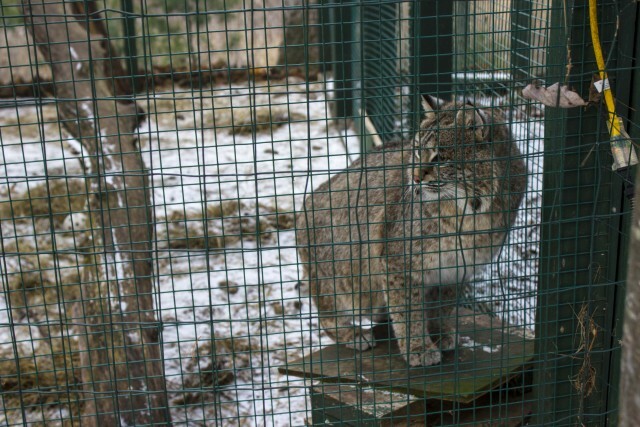 Jonas did, however, give me a sneak peek inside the enclosure. When he opened the door, the little fisher was calmly sitting on top of the small shelter inside the enclosure, seemingly unafraid. Jonas banged the side of the door and yelled, "Run! You're supposed to be afraid!" The kit just jumped down and retrieved the apple Jonas threw into the enclosure. I can see how he could become so attached. It was really, really cute. It's a big challenge deciding how to balance the amount of attention the kit receives because if it doesn't get enough attention it can develop behavioral problems and if it gets too much attention it will lose its fear of humans. Deciding when to release the fisher is the greatest challenge facing Jonas now. Jonas has been advised to release it during the spring out west of Syracuse. Why west of Syracuse? Because there is no trapping in that region. If released here in the Adirondacks its chances of getting trapped are high. He's also torn by his desire to "do right by it" and not release it before it should be (if at all) just to find it has starved to death within a few weeks. Knowing how well the animal will survive is mostly an unknown in a case such as the baby fisher - at least at this point. Each animal that comes into rehab is totally different. Kate explained the different feeding schedules of some of the rehab animals. Song birds need feeding every 20 minutes and others every couple of hours, others only once a day. There's no "textbook" case that comes in, so it's an ever-changing routine depending on resident wildlife and injuries. Mostly the interns' days are spent preparing food and feeding, checking enclosures for damage, and making repairs and gathering firewood to keep themselves warm in the yurts! And, of course, tending to the rehab animals' injuries if necessary. Educating the public about when it's appropriate to call for a rescue and also educating people about animal abuse is something Kate is emotional about. Enlisting the cooperation of wildlife officials can also sometimes be a challenge. In her previous position in Westchester County, Kate had big challenges. "Working with local government officials was one of my biggest challenges personally down there," says Kate. Be on the lookout for the team and some of the "educator" birds and Kiska at various events throughout the year. They make regular appearances. I had the pleasure of seeing Kiska this past October at the Flaming Leaves Festival at the Olympic Ski Jumping Complex. He's a beautiful creature and his bond with Alex is amazing. Why not spend the night in Wilmington in the shadow of Whiteface Mountain so you can get up bright and early and enjoy a leisurely breakfast before your Wolf Walk at 10 a.m. Check our Whiteface Region lodging and dining pages for some options. And hey, why not check out our events calendar as well, to see what else is going on in the region? The Wolf Walk is generally scheduled for Thursday through Monday at 10 a.m. Sometimes, when the wolves are willing, there's an afternoon walk. AWR requests that you call ahead at 518.946.2428 to let them know you'll be coming down and to be sure it's happening. There are occasionally unforseen circumstances some days forcing cancellation of the walks. And don't forget the camera. There are awesome photo ops with the stars of the day, Cree, Kiska and Zeebie - oh, and of course Steve, the 'wolf man' of Wilmington, New York.